Audrey Heller's bite-sized photos tempt the viewer with their deliciously witty, imaginative juxtapositions. Like pictorial petits fours, Audrey Heller's bite-sized photos tempt the viewer with their deliciously witty and imaginative juxtapositions. Common objects are transformed into uncharted worlds behind Audrey's lens. "I often shop for inspiration at the farmers market," Heller confides. "These great, round grapes called my name, and then whispered to me about the wonderful hours they had spent soaking in the sun. I knew they would one day be raisins, but why spoil their fun?" Made in San Francisco, California. Framed in Portland, Oregon. Take a studio tour and see where Audrey Heller brings her miniature models to life. Audrey Heller lives and works in her native San Francisco Bay Area. Since 1996, her photographs have been shown, shared, published and collected around the world. "My photographs draw from my work as a director and lighting designer for theater. I use surreal scenes to bring attention to the beauty and power of everyday objects and daily interactions. I hope to encourage people to see their world a little differently, and a little more joyfully. Enjoy!" 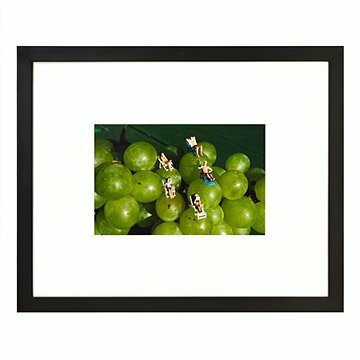 This print is produced on the highest quality photographic paper.